Miki paddling the canoe across the wide lead between the shore and the solid pack ice. She would have given the dogs a ride, but they all opted to swim. Keta takes the lead as the whole crew heads back for the sled, waiting out on the pack ice. 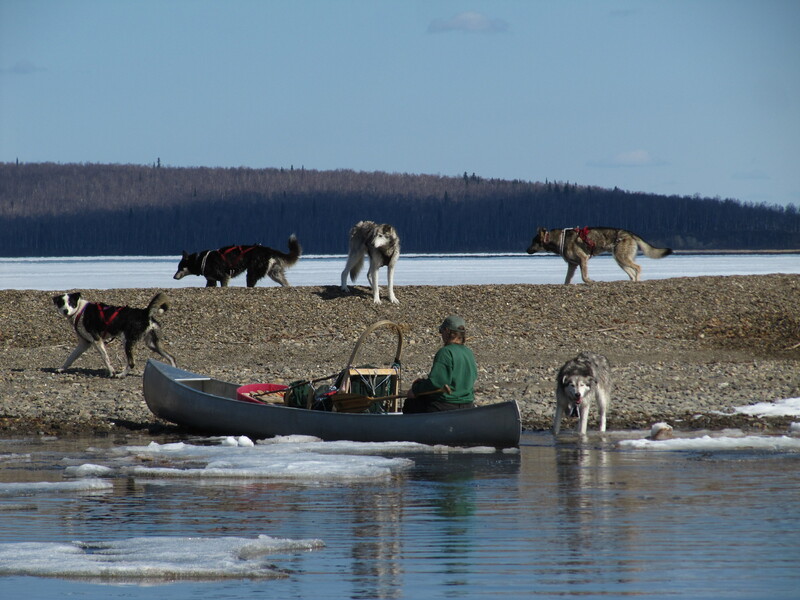 After swimming on ahead, Meeter, Keta, Jiles, Pebbles and Clarence wait for Miki as she paddled the canoe and dog sled ashore from the pack ice on the way home. I harnessed five dogs, each carefully selected from the 15 in our yard: Big old Clarence, my most loyal leader, and his brother, Julie’s leader Jiles. Little Keta, timid with people but fearless around trail hazards. Pebbles, still young but a strong do-anything dog, and Meeter, fearless not because he was brave but because he just didn’t know any better. Each had years of trail experience and proven his courage many times over. Living in the bush gets surprisingly complicated. Julie was flying home on the mail plane, landing at the strip on the far side of the lake six miles away. Although normally a half-hour run, this time would be different. The lake ice might still be over two feet thick on the 5th of May, but a ring of open water around the edge would make traveling problematic at best. I’d need every bit of trust, experience and courage my little crew could offer. 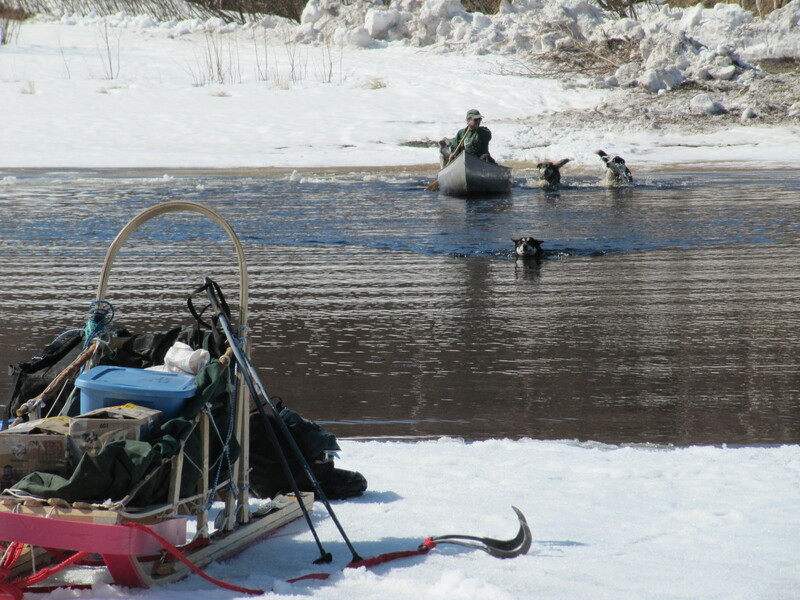 Harnessed and careening around loose, the dogs hiked with me to where our sled and canoe waited on the lake shore. Normally the shore lead is wide open right up to the edge of the solid pack ice. This time rotting chunks of ice lurked partway out, and a 25° F. night had covered the 100-foot-wide shore lead with a quarter inch of skim ice. I strapped on a life vest, wrestled the dog sled into the canoe, and pushing through loose ice, paddle to the pack ice. Usually the dogs swim along, but that skim ice stopped half of them, and the rotting ice edge turned back the other half. After moving the sled over to solid ice, I paddled back, loaded Clarence and hauled him across. As I returned for another dog, my big loyal leader ran back and forth along the ice edge, anxious not to be left behind. By the time I had Keta in the canoe; Clarence had fallen in and swum ashore. I got them both back onto the ice. By the time I had tied Clarence to the sled; Keta had fallen in and swum ashore. When I returned for Pebbles, Keta bravely swam back to the ice with me and I helped her scramble out of the icy water, tying her with Clarence. By the time I loaded Jiles at the beach, Pebbles was swimming ashore. The whole crossing took about an hour, and I was glad I only had five critters. Finally hitched up as a team, the dogs instantly switched into sled dog mode. No longer five dogs dashing crazily about in their own directions: as one they surged powerfully forward, clinging to the faint mark of the winter trail. Aluminum canoe thundering along behind, my sled skittered wildly over an icy surface honeycombed by snowmelt. With the dogs relieved to be in harness, the mushing proved the simplest and fastest part of the day. In lead, Clarence and Keta didn’t slow when we neared the far side, but as the 200-foot wide shore line came into sight, their ears flicked worriedly. All five seemed relieved when I sang out “Whoa” right at the ice edge. 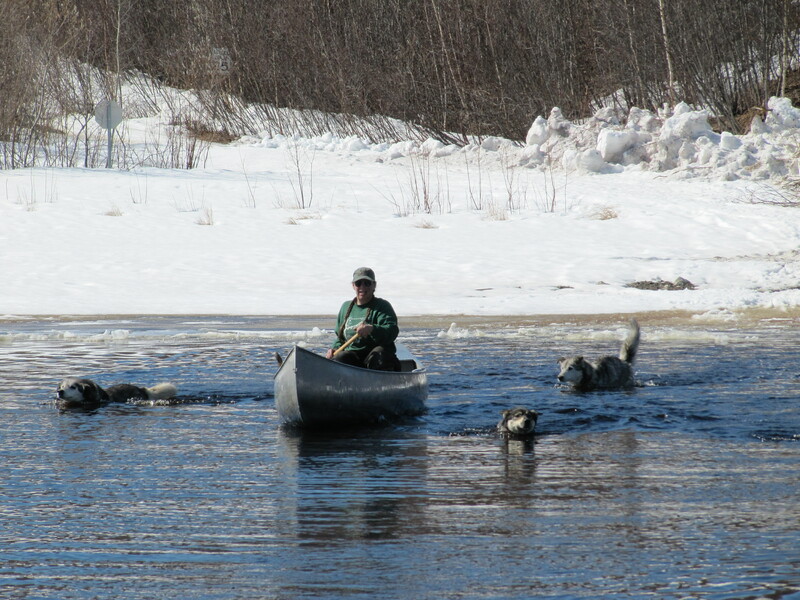 Turning the dogs loose, I hauled my plastic tub of warm clothes, mail and emergency sat phone across with the canoe. I would have gone back for the dogs, but by the time I beached, each one had plunged over the edge to swim bravely after me. Picketing my wet critters on a grassy, sun-swept slope, I left them to make the last mile-long hike down the gravel road to the Post Office where Julie waited. By the time we were ready to head home, the dogs had worked up a pretty good head of steam. I paddled Julie to the ice with our load before returning for the dogs, now on their feet and hollering, anxious not to be left behind. Finally I turned each one loose. The quintet swarmed around as I climbed into the canoe and paddled out over deep, cold black water. All ahead and beside and behind, those fine good dogs courageously swam with me. Finally all stood in harness, hitched to the sled and waiting for the word. As one, our soggy pack lunged for home, as happy and loyal a crew as you could ever ask for. Written by Miki Collins, co-author of Dog Driver: A Guide for the Serious Musher, Revised Edition. This entry was posted in sled dogs and tagged Miki Collins, mushing, sled dog, sled dogs, sledding across the open water. Bookmark the permalink.